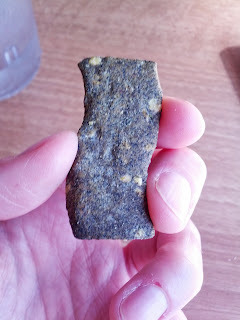 I love to try out new snacks, particular salty, crunchy ones, like interesting chips. 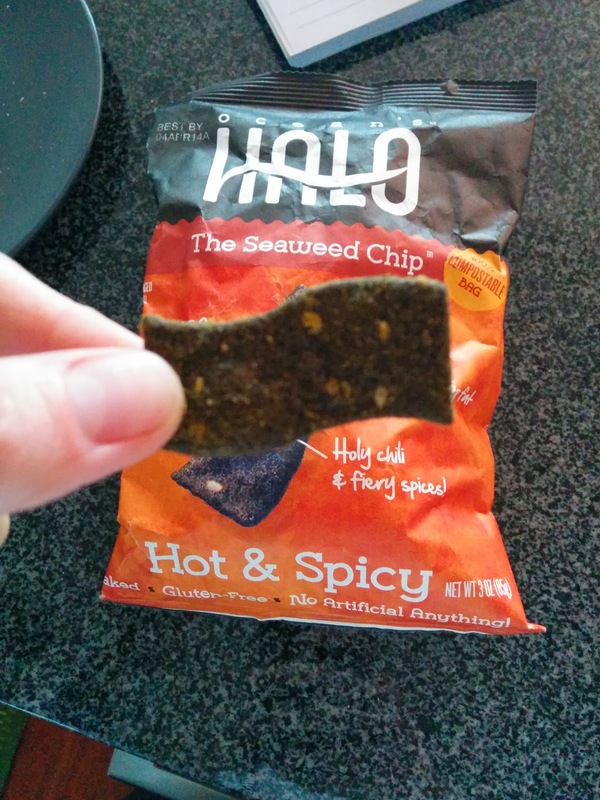 So when I saw Ocean's Halo "seaweed chips", I was intrigued. Unlike just dried seaweed snacks, these are actual chips, made from seaweed and rice flour. According to their website, "Ocean’s Halo™ Seaweed Chips are the first totally delicious crispy, crunchy chip made from natural, sustainablely harvested and nutrient-rich seaweed. Perfect for anyone who craves a snack that is as delicious as it is nutritious." I really couldn't figure these out. I wanted to like them. I loved the idea. I like seaweed flavor. But, after several tries, I'm still not really sure I liked them. They were kinda fishy ... which I do appreciate in seaweed, but they were more like old fish fishy vs fresh fresh fishy, if that makes any sense. They had a good crunch. But … yeah, not quite right. Next I tried the Hot & Spicy. Same basic chip, which I liked for the crunch, but it was again too fishy for me. The spices were great though, a nice amount of kick, but still quite pleasant, so I could easily eat a bunch of these. Cupcakes are seemingly still a thing. I kinda thought they'd be over by now. But I guess I'm part of the problem, as I continue to try cupcakes all over the place, even though I am rarely happy with them. I've had cupcakes from Cako before, and didn't love them. But ... I was reading their website for some reason, and it had FREE CUPCAKE in big font. Just join their club and get a free cupcake on your birthday! I can't resist freebies, so I gave them another shot. This is the first time I ever got one to-go, rather than just eating it right away. They package them up all cute, in a little holder that prevents it from falling over, with a cellophane bag around it. The packaging seems great in theory, but, it is a good thing I took the photo right away rather than waiting until I got home. While it didn't fall over, the cellophane did completely cave in on the cupcake, and most of my frosting wound up on the cellophane. And it certainly didn't look pretty after this. 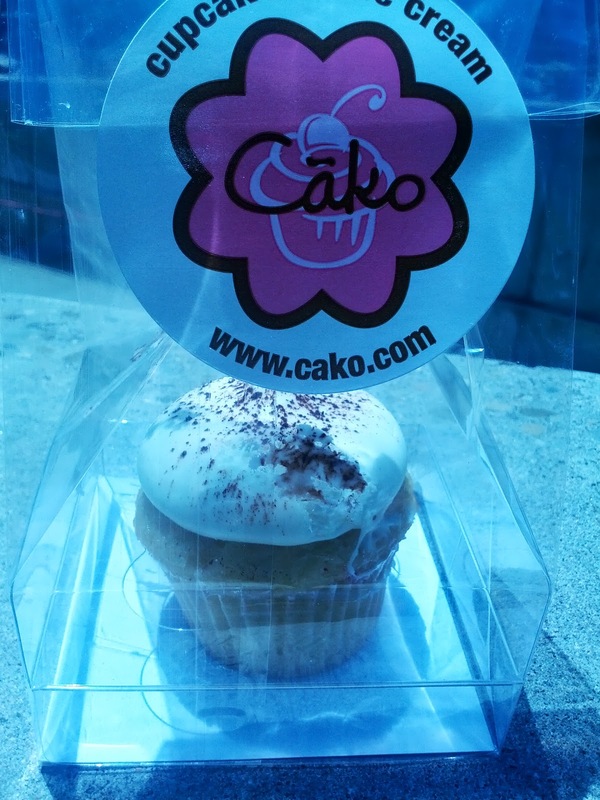 The tiramisu cupcake base is their standard vanilla cake, with a rum and espresso soaked center and bottom. Or at least, I'm guessing that is what it is, given the name tiramisu. It didn't actually taste boozy, or like coffee, but the inside was insanely moist, soggy even, and was brown colored. I didn't really like the cake much, even the vanilla shell had a strange moistness to it. But, the very soggy center was reminiscent of the namesake. The frosting was mascarpone, and pretty tasty. Sweet, but not too sweet, fluffy, and well, mascarpone flavored. Again, it lived up to the tiramisu name well. The frosting was my favorite part, and I ended up getting a knife to scrape all the mushed frosting off the inside of the wrapper. There was also a little cocoa dusting on top, which looked cute, but wasn't really noticeable, flavor-wise. Overall rating though, meh. Probably the best of their cupcakes that I've tried, but I wouldn't get another. As I mentioned last week, for several days in a row, I had the task of providing dinner for a group at work. And since I'm a bit of a food snob, I could not be satisfied with just ordering delivery pizza. 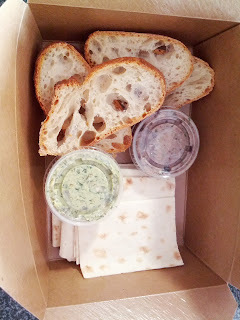 The first day, I went for cold Vietnamese salads and desserts from Miss Saigon, along with spring rolls from Freshroll. It was all good enough, casual, and worked well for take out. But I had bigger ambitions. I wanted a really good meal. The problem is, hot food delivered always arrives cold and soggy. Even if I were to pick it up from somewhere nearby, it would be lukewarm. I needed food that would be good cold in the first place, but I didn't want just a bunch of standard salads or sandwiches. I wanted a satisfying dinner! I browsed around looking at menus of nearby places, and thought long and hard about memorable cold dishes. I found the perfect answer: Zare at Fly Trap! I've long been a fan of Fly Trap, and used to visit the restaurant regularly. I love Chef Hoss's Persian spin on classic French cuisine. Or perhaps French spin on Persian cuisine? Of course with local California flair thrown in there. Also, if you've ever met Hoss, you'll understand why he is known for his "Hoss-pitality". He's not only a wonderful chef, but an incredibly generous man, always so welcoming. On my last visit to Fly Trap, I was absolutely blown away by one of the salads, smoked trout over cucumber "linguine". 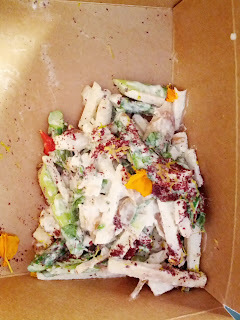 And I recently attended a demo by Hoss where he made an insanely delicious spring salad with asparagus, apple, jicama, caramelized shallots, and marscapone, in a yogurt citrus dressing. I'm not much of a salad girl, but these were both phenomenal, and I knew would be perfect for take out. I contacted Hoss on Facebook before my visit, in order to get a current menu. I was thrilled to see that both of the salads were on the menu, along with a few other cold dishes that sounded great. And of course, desserts. I had a plan! I headed to the restaurant right when they opened, and perched myself at the bar to place my order and wait for my food. While I waited, I decided to treat myself to a cocktail. Benefits of being the one doing the pickup, right? 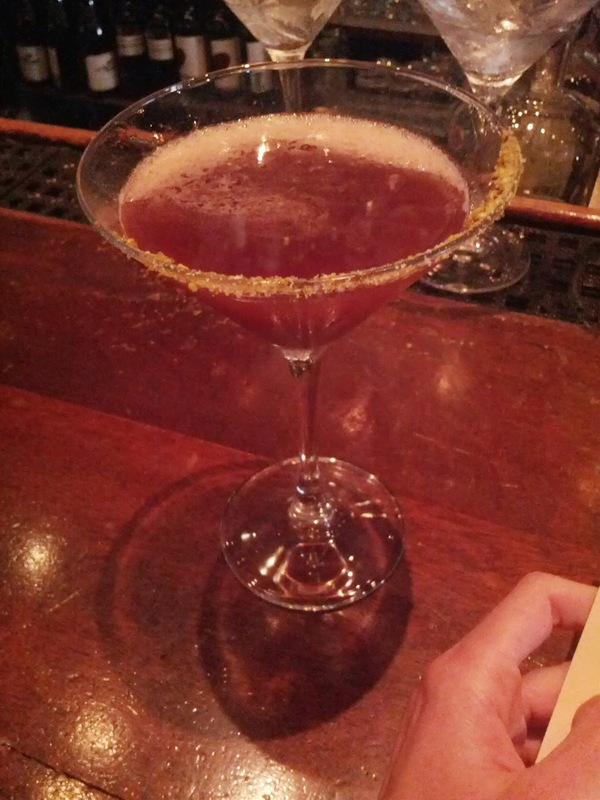 I selected the daiquiri, made with pampero anniversary rum, veev, clear creek cassis liqueur, pistachio. I was expecting this to be sweet, but it was bitter. Not quite my style, but nicely balanced. I did like the pistachio on the rim though. I wouldn't get it again, but that is just personal preference. When I lived near Fly Trap, I used to swing by regularly, just to get the lavash and tapanade to bring home. I've also ordered it pretty much every time I've been to Fly Trap. The dips are just addicting! 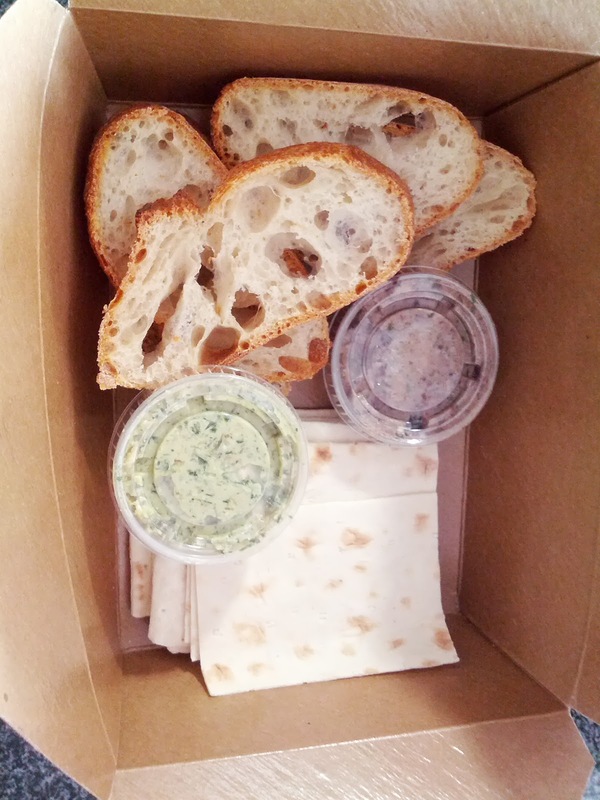 The lavash and bread are normally toasted, but since I was getting take out, I asked to have the bread not toasted, so that I could toast it and have it fresh when I served it. It worked like a charm, I toasted it in the toaster oven at serving time, and provided my co-workers bread just as warm as it would have been at the restaurant. The tapenades were both as delicious as ever, and I loved combining them together into a single bite. $6 was a fine price, and I'll continue to get this as a starter whenever I go. I also got the hummus trio as a starter, which also came with a side of lavash (I didn't take a photo of that, since it was the same). The trio was chickpea, roasted squash, and roasted beet. The chickpea was a fairly standard hummus, but I don't tend to like chickpea hummus, so it was my least favorite. The squash one was my second favorite, but not something I loved. 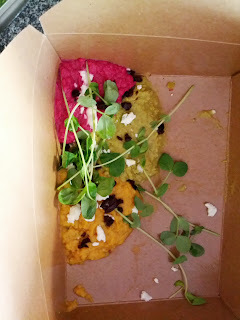 The beet was fresh and colorful, and my favorite. I am not a huge hummus fan, but I got these to provide the team with a bit more food that would be good for takeout. I wouldn't normally order this, and $12 for a small amount of hummus did seem a bit high. It was a pretty dish though, and I imagine it looks great when they serve it at the restaurant. I appreciated that they even included the garnish for take out! Smoked trout, cucumber, seaweed, tobiko, dill salad. $14. And here it was, my smoked trout salad! As I said, I had it last time I was at the restaurant, and it was the dish of the night. I was really looking forward to it again! 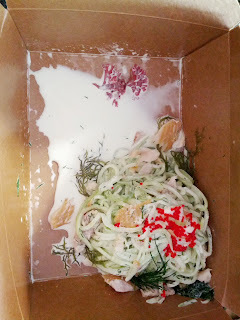 The cucumber is cut like linguini, tossed with dill and seaweed, served with a crème fraîche based dressing, and topped with tobiko and smoked trout. It was pretty much exactly the same, albeit not quite as nicely plated :) The cucumber was fresh and didn't get soggy, even though it was take out. The trout had a wonderful smokey flavor. The tobiko added a little pop. And the dressing was creamy without being heavy. I again loved the dill. Refreshing, flavorful, and enjoyable. I'd still get it again, and $14 for a salad this size, with so much smoked trout, was a good price. Everyone loved it. Spring salad with asparagus, apple, jicama, caramelized shallots, marscapone, yogurt citrus dressing. $13. I first enjoyed this salad at a cooking demo that Hoss gave at the Cuesa market. I was blown away then, so I was happy to see it on the menu! If you want to make it yourself, you can find the recipe here. Again, fresh, flavorful, tasty. $13 for a quality salad was right in line. We all loved this too. Scallop crudo with assorted house pickles. $15. Since we were sticking with cold dishes, in addition to the salads, I also got the crudo. The scallops were delightful. Sweet, tender, just perfect. Fresh, quality, delicious. I could have eaten several orders of this myself. 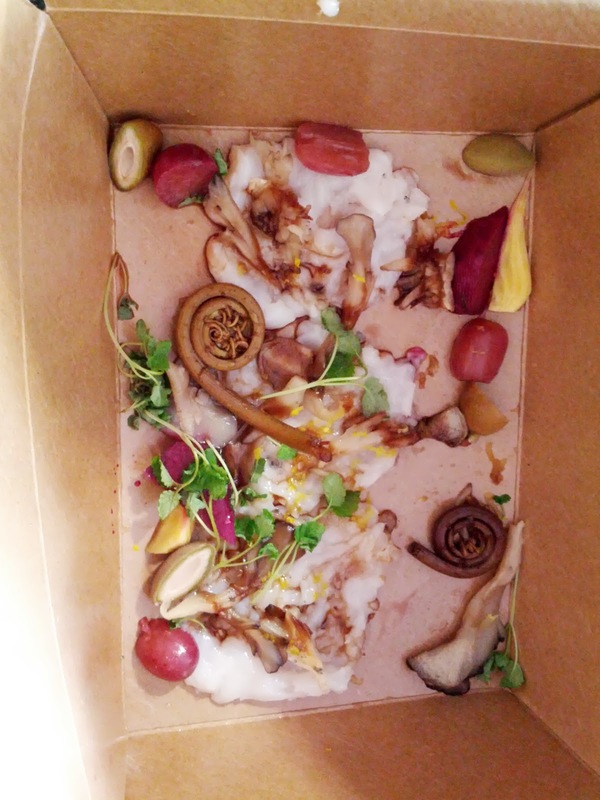 They were accompanied by a crazy assortment of pickles: ramps, wild mushrooms, caper berries, beets, grapes ... and I'm sure other things I'm forgetting. These were all really nicely done, tart but not too vinegary. The ramps were particularly crunchy and a fun component. Sweet delicate scallops and tart pickles were a bit of a strange combination though. I loved them all separately but together it didn't quite work. The grapes were a good bridge, sweet and the most mild of the pickles. Texture-wise, I appreciated the crispy accompaniment to the very tender scallops. The price was also right, and given the elaborate plating of this for take out, I can only imagine how beautiful it is in the restaurant. 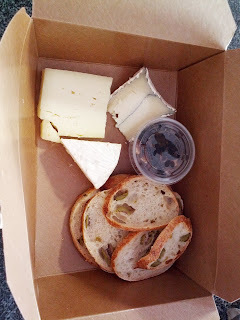 Cheese Plate, Olive Bread, Walnuts, Honey. $14. Because Emil was one of the diners, we obviously had to get a cheese plate. I didn't have any of the cheeses, but Emil and the other person who ate it complimented the cheeses, and in particular, the selection of cheeses together. Served with olive bread, again normally toasted. I did try the sweet accompaniment of course, a mix of walnuts, honey, and we think soaked black walnuts. It was actually really tasty, and I'm sure went perfectly with the cheese. Price was right for a cheese plate, and the folks who ate this were happy. Baklava, Persian Cream, Rose Preserves. $9. This was a fun take on baklava. 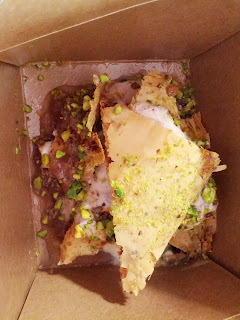 Not just a standard piece of baklava, instead it was filo dough layered with a cream, all garnished with chopped pistachio and rose preserves. It had all the classic flavors of traditional baklava, with the nuts and sweetness, but the deconstructed form, plus the cream, made it far more fun. I liked this much more than standard baklava, and $9 for a quality restaurant dessert was right in line. Peach and Huckleberry Crisp. $10. As I mentioned, since I was getting take out, I got only cold dishes, and asked for the breads to not be toasted. 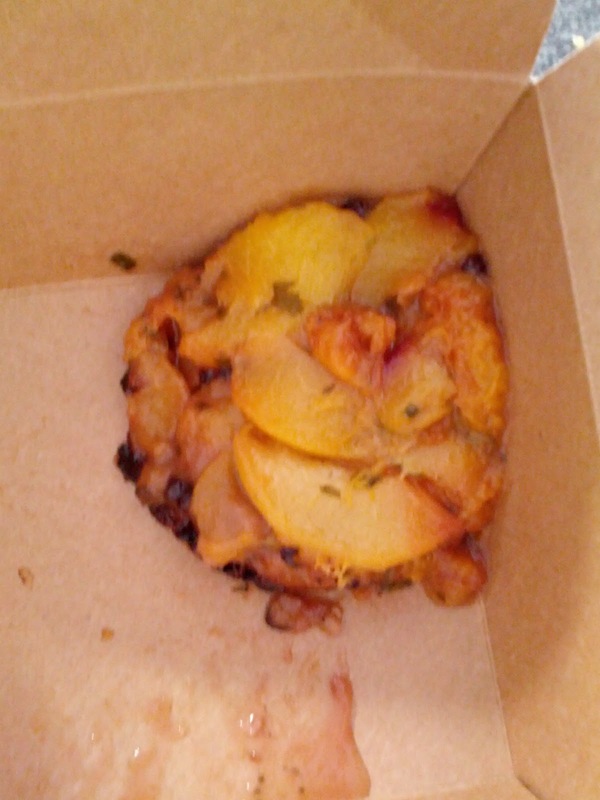 This plan worked perfectly, except that I totally forgot that the crisp is served warm, until I felt the warm box. Whoops! I'm glad they serve warm crisp though, nothing disappoints me more than a cold crisp! If you've read my blog for a while now, you know that warm fruit crisp and cold ice cream is my absolute favorite dessert. I stuck the crisp back in the toaster oven for a few minutes when it was time to serve it, and it heated up again nicely. I don't think anything was lost by bringing it home and re-warming. Although described as peach and huckleberry, the crisp was mostly peaches. There were a few tiny little huckleberries that added a touch of color, but there were so few that I didn't taste them. The peaches were naturally sweet, but they were not over-sweetened, which can often be a problem with fruit desserts. The fruit was allowed to speak for itself, in the way that ripe stone fruit at its peak can do. They were nicely cooked, soft but still a good texture, not too mushy. There wasn't much crisp to the "crisp" though. None on top as I expected from a traditional preparation, and only a little under the fruit. It did add a bit of crunch, and the edge was a bit caramelized which was awesome, but it was lacking in the "crisp" component of the crisp. The crisp also came with ice cream, which they packaged up so nicely, in its own separate container, over a cup of ice. It didn't melt at all on my walk back with it! I'm so glad I took the risk and went for a dish with ice cream, I was a little worried it would be a complete mess for take out. The apricot flavor wasn't very strong, but it was refreshing. Hard to see in the photo, but there were whole tarragon leaves as garnish as well. 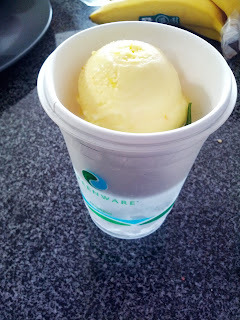 It wasn't the creamiest ice cream, almost more like sorbet, but I just absolutely love hot fruit desserts paired with cold ice cream, so I was quite pleased. I thought the pairing of peach with apricot might be a little too much sweet on sweet, but it worked. The $10 price, for a warm dessert and ice cream, was right on target. It has been exactly one year since I discovered Rubio's, as part of my epic birthday freebie quest. I've returned many times since, and have always been fairly impressed, particularly for the price point. Since I've reviewed Rubio's a zillion times, I'll skip all the general comments this time, and focus only on the meal I had this time. Pacific Mahi Mahi Taco, No-fried Pinto Beans, Chips. $5.46. Described as "Pacific mahi mahi, a mild, white fish, seasoned in olive oil and garlic or house blackened with a mix of spices, grilled on an authentic comal, and topped with fire-roasted corn with a hint of chile, our creamy chipotle sauce, a cilantro/onion mix and red and green cabbage. 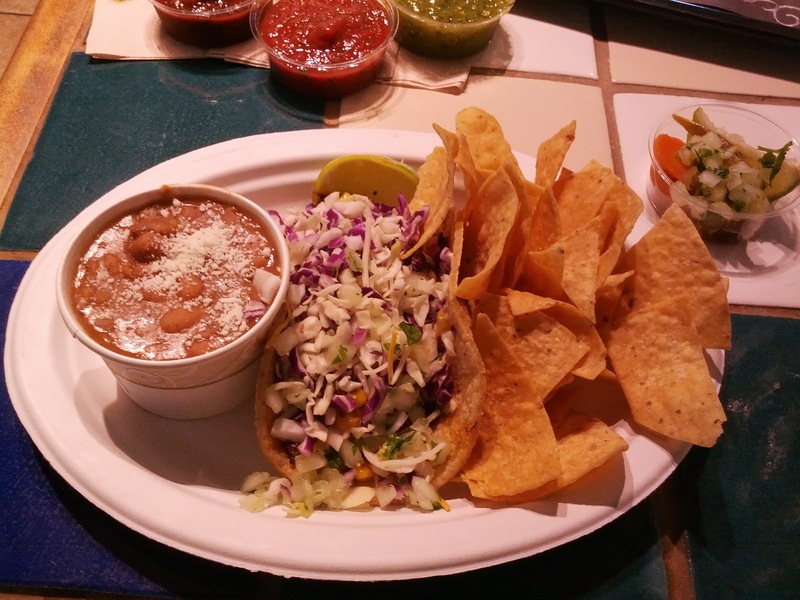 Served on a warm stone-ground corn tortilla and garnished with a slice of lime." The taco contained a huge filet of mahi mahi and was loaded up with other ingredients. It was easily the fullest taco I've received at Rubio's. Since I liked the blackened seasoning when I had it with the tilapia, I went for it again. However, just like last time when I had it with the mango habanero mahi, the blackening totally overwhelmed the fish, and all other flavors in the taco. It worked with the tilapia, but I won't be trying it again with the mahi. The fish was nicely cooked, tender, flaky, although just a bit fishy. The tortilla was unremarkable, their standard corn tortilla, with a nice corn flavor, warm, but not as toasted and nice as on several other visits. The fire-roasted corn, which I really liked when it was included in other tacos, didn't have the same great roasted flavor this time around, and I didn't detect any of the chile. The cabbage, cilantro, and onion mix helped round out the taco, provided some crunch, but weren't as memorable as the other slaws. I saw some of the creamy chipotle sauce, but didn't taste it, likely due to the blackening. I realized once I got my receipt the the person taking my order entered this as a single taco plate, with beans and chips. I wasn't planning to get those, as I haven't ever cared for them in the past, but since this was a freebie, I didn't bother correcting it. The beans were just the same as always, hot, fresh, creamy, topped with a little queso fresco. I'm sure if I liked beans, they would have been good, but they just aren't my thing. I tried a few bites, but brought the rest to Ojan. The chips were also the same as always, not hot, barely salted, just not remarkable. I had a few, along with all the salsas from the salsa bar, but just wasn't into any of it. I felt the same about the salsas as my previous visits: tomatillo is just watery and blah, mild is not flavorful enough and tastes just like tomato, the picante tastes burnt, and the roasted chipotle was my favorite, but still not great. Thus, Ojan also received some chips and salsa. Overall, there wasn't anything all that wrong with this taco, but it just didn't come together well, and the blackening was too much. I won't get it again. Since I hadn't used my full $7 birthday credit, I decided to throw on a churro as well. 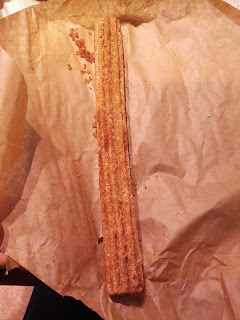 I've only tried the churro at Rubio's once before, and I really didn't like it, but I wanted to give them another chance. It was the same as the previous time: really crispy, oily, loaded up with cinnamon and sugar, and just not very good. I gave it to a co-worker, who seemed to enjoy it though. I have very little familiarity with 7-Eleven. I grew up in a town without one, and as far as I know, there still aren't any within miles of my hometown. Although I'd heard of them, I didn't have my first Slurpee until last summer. Beyond Slurpees, I knew basically nothing about 7-Eleven. Just a convenience store right? When I went on my Slurpee visit I noticed that they had things like hot dogs and nachos, but I couldn't imagine ever getting food there. Except, I love baked goods. Now, I don't even get baked goods from Whole Foods, let alone from a convenience store, since I always think they aren't very good, and want bakery fresh items! If muffins or scones are more than an hour or so old, I don't generally want anything to do with them, even if they are homemade. So why on earth would I get a baked good from 7-Eleven? Well, for one, it was free. And I love my freebies. 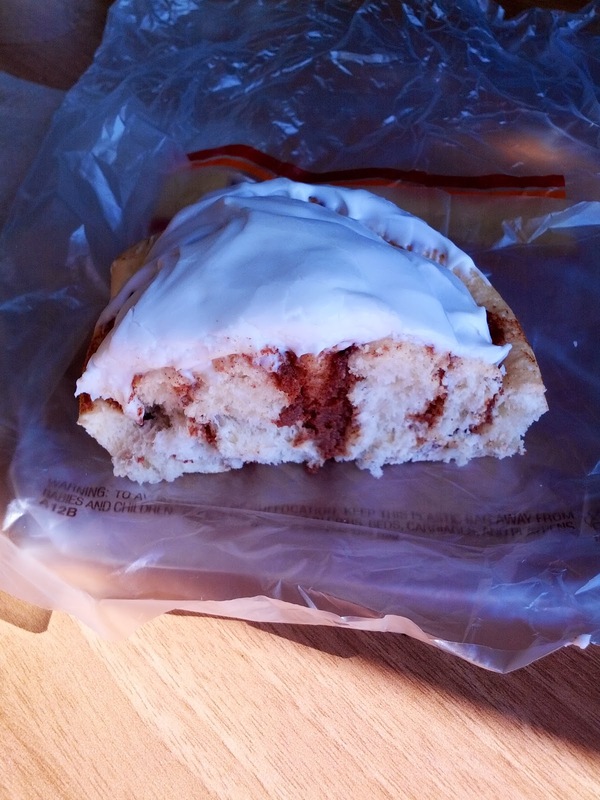 7-Eleven just introduced these new cinnamon rolls, in partnership with Pillsbury. Apparently some stores will offer them hot and fresh, although the one I visited only had them in the bakery case, along with donuts. 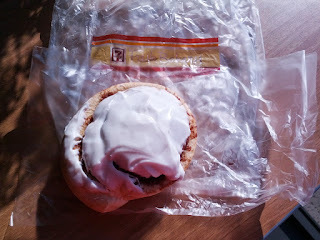 There were signs everywhere instructing me to get my cinnamon roll and put it in the provided microwave safe box, and warm it up for 10 seconds in the microwave. While I was able to find the cinnamon roll, and the microwave, the magic boxes were nowhere to be found. Just standard plastic bakery bags were available, and uh, clearly were not suitable for the microwave. Undeterred, I got my cinnamon roll, scanned the app to redeem my freebie, and gleefully went out the door, and headed for my toaster oven instead. The roll did not look like much. It looked just as stale and unremarkable as all of the other baked goods in the case. The sign said it was baked fresh every morning at local bakeries, and delivered fresh to 7-Eleven daily. I was skeptical. It was huge, which makes sense given the $1.69 price tag. Obviously, if I was getting it from a real bakery, or even Starbucks, I'd expect a high price, but it seemed a bit much for 7-Eleven. I know Ojan loves cinnamon rolls, from fancy versions to run-of-the-mill Cinnabon, so I figured that if I didn't like it, I could just give it to him. And given its size, I planned to give him half anyway. Spoiler: he didn't get half! So, I cut it in half, and set aside a half for Ojan. I first tried it at room temperature. It wasn't great. The dough was just kinda there, there was plentiful cinnamon sugar filling, between each layer, and a giant glob in the center, but none of it was that good. The icing was solid and looked ridiculous. There was so much of it. But, the whole idea behind these is that they are to be consumed hot. Since I dislike mircowaves, I popped it in the toaster oven for a few minutes instead. Within moments, the air was filled with the amazing aroma of freshly baked cinnamon rolls. I perked up. And then I tasted it. Once it was warm, this thing completely transformed. The icing, that originally looked like an insane amount, melted into the cinnamon roll. It was sweet, but not too sweet, perfect glaze on top. Maybe there was still a little bit more than necessary, but it turned out to be far less of an issue than it looked before it was melted. The roll itself is what really transformed. It became moist on the inside, with a slight crispness to the outside. The cinnamon and sugar got a bit melty. The dough was soft, and just slightly sweet on its own. The sweetness came from the cinnamon and sugar, and the icing, and really wasn't overdone as I had feared. This thing was delicious. Honestly, indistinguishable from a freshly baked cinnamon roll. I tried to use restraint, but found myself going and taking another big chunk from the half I'd stashed for Ojan. Sorry, it was just too good! I have no idea if the effect of reheating in the toaster oven is the same as in their magic box in the microwave. Perhaps I'd try that next time, but honestly, it was just too good this way to consider messing with it. When Ojan tried the bite I rationed for him it a few hours later, he agreed that it was amazing. He asked for another one.